4. last weeks nostalgia for knitting sleeves TAAT. 1. The pregnancy is that of my favourite crazy Colombian friend Maria and her husband Juan. Maria is the pitcher on my softball team, well she was, she's benched this season for fairly obvious reasons. Maria is know for yelling encouragement loudly, striking people out and dancing on the pitch when things get a bit too serious. Her baby is due in March (Southern Hemisphere Autumn) and the gender isn't being revealed until the baby shower. So I've decided to make a gender neutral gift, which is my favourite thing to do as it means that it can be re-used for subsequent children or easily passed on to friends. I may knit something else after the reveal, who knows. 2. The stash down has been a good thing for me. 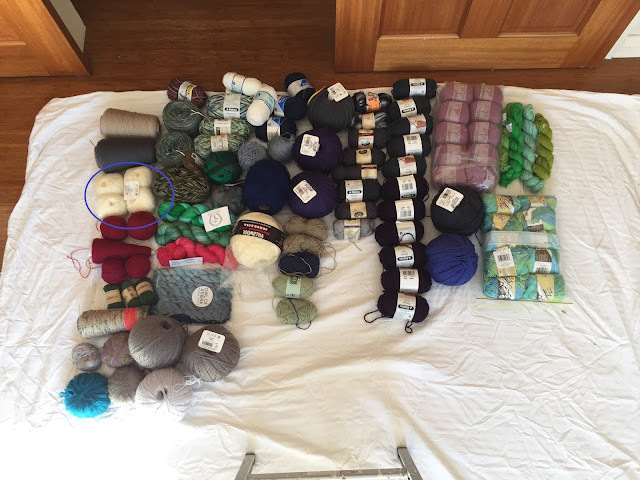 As soon as I finish a project, sometimes a bit before, I consider my next recipient and then look back over the stash photo and usually find exactly what I'm looking for. My discipline is pretty astounding, I totally thought I would fail by now. The yarn is from Bendigo Woollen Mills, unfortunately its only available from the shop and not online. 3. With yarn mentally selected I then trawl through the Ravelry database looking for a suitable pattern (if you didn't look before, you should look the model is very cute). I thought this older style pattern looked like it had the perfect combination of technical bits and mindless knitting. 4. and after last weeks whinge about knitting TAAT I though I should get back to knitting basics and reaquaint myself with knitting flat and seaming. Although to be honest I am knitting myself a little that I didn't modify the pattern and knit the body in the round. and as for the change of scale here it is compared next to the cardigan which is currently on the blocking mats. The purple cardi is going to be modelled next tomorrow so I hope I will be able to show you some nice picture in my next post. That pattern is gorgeous, was it Purlsoho? I love the squarey-ness! The yarn they use in the sample is so lovely, but yours is good for gender neutral, it'll look good over anything. 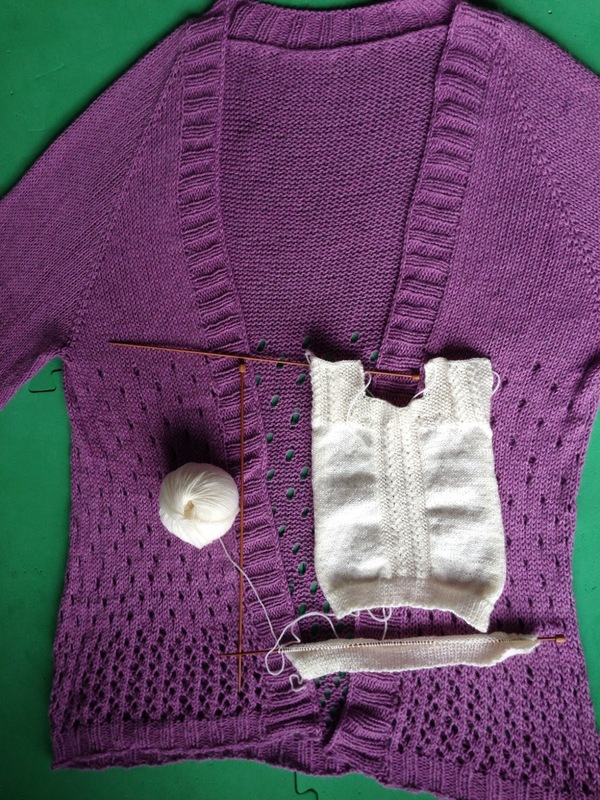 The purple cardi looks fab, funny how the colour looks different every time I see a photo of it!